Lexi, the talent behind the highly acclaimed recipe blog Lexi's Clean Kitchen, answers the demand for a one-stop cookbook that takes the focus off of the constraints of modern dieting and puts the spotlight back on achieving health and happiness through one simple concept—eating clean. While applying the invaluable principles of gluten-free and Paleo lifestyles, Lexi's Clean Kitchen: 150 Delicious Paleo-Friendly Recipes to Nourish Your Life takes a practical approach to clean eating that won't deprive you of your favorite foods. This cookbook transcends dietary labels—it is for everyone who loves preparing delectable meals that satisfy every palate and craving. Lexi's Clean Kitchen is a complete guide to putting together delicious meals from nutrient-dense whole foods. 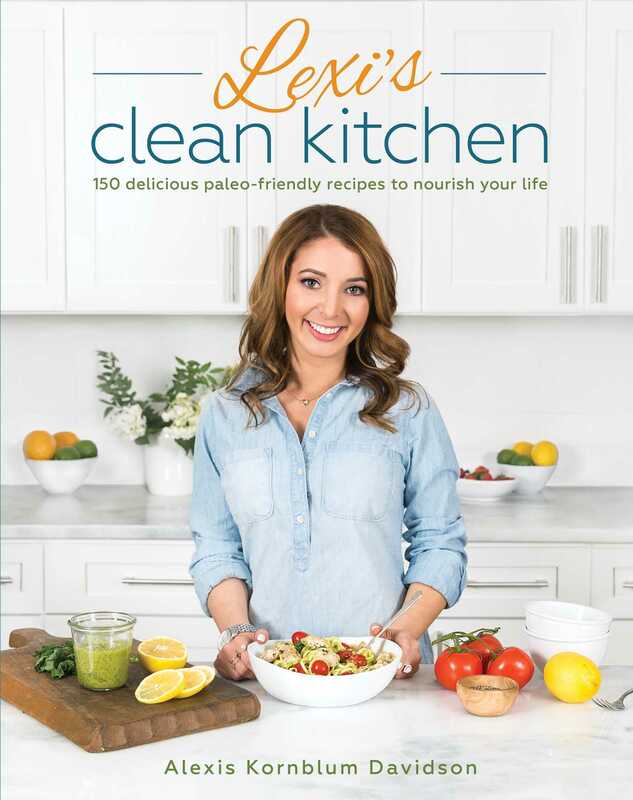 Lexi's Clean Kitchen is packed with more than 150 nourishing recipes, full-color photos, shopping lists, how-to guides, and simple tips for customizing your clean lifestyle, making each step of the way approachable and, above all, enjoyable! Lexi delivers healthy meals packed with flavor, like Thai Meatballs, Classic Chili, One-Pan Arroz con Pollo, Maple-Glazed Salmon, and Sriracha Lime Chopped Chicken Salad, with healthier options of your favorite indulgent foods, like French Toast Sticks, Perfect Waffles, Birthday Cake, Easy Sandwich Bread, and more. If your mantra is to eat clean in 2017, this is the recipe book to own. Lexi has created such a beautiful cookbook. There are so many mouth-watering choices, I don't even know where to begin! Aji Tuna Bites, Proscuitto Flatbread with Grilled Peaches, Creamy Chicken Bacon Spaghetti Squash Bowls – sign me up! Even if you don’t follow a Paleo lifestyle, anyone can enjoy this cookbook. Creative. Exciting. Delicious. Clean! These are the words that come to mind when I think of Lexi's recipes - and this book is a beautiful collection of the best of the best. Lexi takes the guesswork out of cooking healthy meals that'll keep your whole family happy and eager to sit down to eat. Her recipes are completely approachable, but with just the right amount of flair to keep you on your toes, keep the flavors bold, and delight your palate. When you thought every paleo recipe had already been made, Lexi proves that her creativity is endless. With recipes like French Toast Sticks, Focaccia Bread, and New England Lobster Rolls, you will constantly be amazed what you are still able to eat while eating clean! If you were to stock your bookshelf with just one cookbook, it should be this one because you will absolutely never get bored when it comes to your healthy meals! -Juli Bauer, New York Times best-selling author of The Paleo Kitchen, Juli Bauer's Paleo Cookbook and OMG. That's Paleo? First of all, the moment I started reading Lexi’s book I could relate to the gut issues she wrote about and the journey that she took to overcome them and find the healthiest, happiest version of herself. As a fellow believer in the power of food, you could NOT be in better hands than you are with this book. From health do’s and don’ts to tons of amazing recipes — those chia puddings, by the way, WOW — you will find yourself inspired to get in the kitchen and choose your healthiest you! Plus, those food photography skills are untouchable. This cookbook proves that healthy eating doesn’t have to be boring or restrictive. I love how Lexi makes clean eating so flexible and approachable, with a delicious collection of recipes that will have you drooling!